Populating the budgeting spreadsheet for my recent kit home owner build, involved a number of systems and a lot of research and legwork. I struggled to 'stick' to the budget as I'd hoped as many costs were not set in stone, ideas changed as the build progressed, and more than once tradeworkers changed, including quotes. For me it was a good idea to have a contingency of 15%, although having any contingency invites overspending. So to describe my budgeting techniques, here are my six parameters that assisted me. As an owner builder I need to direct all activities on site and do a great deal of the work to get this build complete. So my first decisions, outlined below, helped me to initially cost the project and build my budgeting spreadsheet. a. Do I work full time on the project and get it done asap? This would require a 'gap' year, resignation, or both in my case. This is the avenue I chose. I decided to work full time (5-6 days per week) on the project and from Development approval submission to final move in approval it took 8 months. I did a lot of the work myself: fencing, frame erection, door and window installation, cladding, rendering, architraving and skirting, painting, landscaping. And I did it as a solo worker. b. Work part time and devote three to four days a week to the build. Working part time would have been stressfull and exhausting for me. Worrying about tradework going on at the site without supervision, not having any time off to recover each week, and lengthening the build time to 9-12 months. Unless I hired more of the work out which would raise the build costs. c. Stay at work and hire out all tasks, and work on site on the weekends. 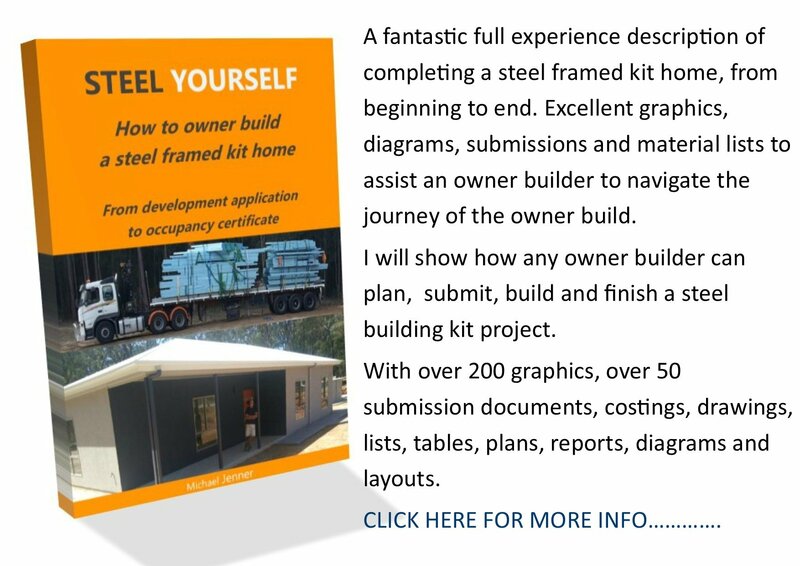 This can only be done if you hire a tradeworker such as a carpenter/builder to do all of the work and direct other trade activities on site. Lots of communication by phone as many decisions need to be done daily, as well as being on site every evening to catch up. Many OBs use this system, but be careful who you choose. 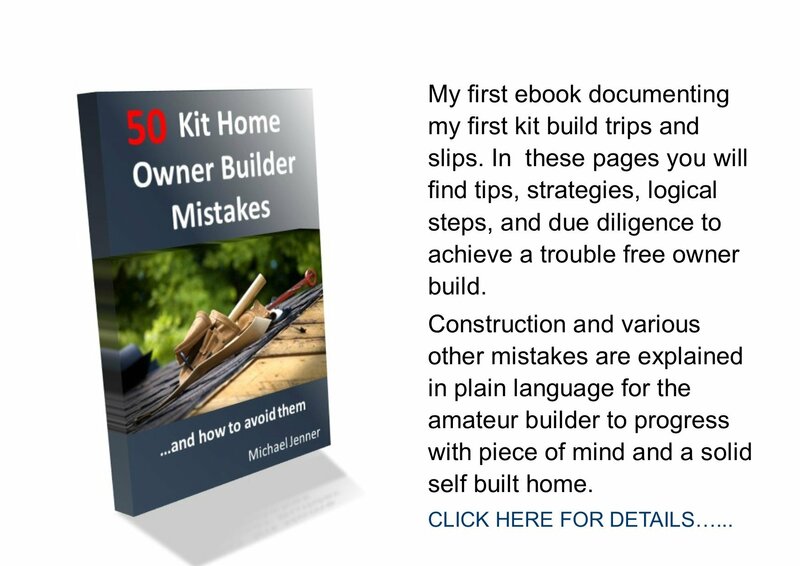 Beware: if a builder is building your home, they must supply guarantees. This obviously is the most expensive way, but you are earning money while the build proceeds. d. Hire helpers/labourers to assist me. This adds more expense but reduces time considerably. As I was full time on the project, time wasn't so much of a concern to me. More of a concern was dealing with the red tape of employing somebody, such as precise bookkeeping, paying long service leave, superannuation, insurance and tax. So I chose not to hire. These were the easily priced items on the project: land, kit home, council fees, insurance, survey, pest control, phone connection, shed, water tank, pump, fireplace, kitchen, flooring, solar, PC items (vanities, toilets, lights and fans) etc. This was just a matter of visiting showrooms, making phone calls, researching on the internet and entering the values into the budgeting spreadsheet (outlined below). The trick was, staying with your original choices, when you come to purchasing. This took time and was seldom exact. For instance a plasterer will never give a firm quote on a house that doesn't yet exist. Either will a roofer. I needed quotes on a slab, roofing install, electrical, plumbing, waterproofing, plastering etc. Trade quoters know that if you accept a 'ballpark', an added premium when you need it done will likely be accepted. So if I got a 'ballpark' quote, I added 15%. For me, this is where blowouts occurred constantly. Items such as fencing, landscaping, paint, tiling, render, tools etc. Going to the local hardware and finding things to buy, not on the list, was a constant problem. A Gantt chart gives you the power to make early decisions on delivery orders, my time on site, when tradework is ready to be done and when I might finally finish. I could also get the relatives to pencil in a road trip, within a week or two, to help me with painting. This is all part of the project management which saves money by timing all activities. If I failed to setup a plumber to finish a task, other tasks contingent on that work could not be done, delaying and costing the project. Here is a Project Management page on my site that has a Gantt chart example. Now that I had all the info and numbers, it was time to populate my spreadsheet. Here is my spreadsheet to download, no email required, just click on the spreadsheet image and a big Jpeg of the file will download. Save it, set up your own excel spreadsheet and transfer what you need to start your project off. Staying on budget requires constant monitoring of your budgeting spreadsheet file, making hard decisions about costs, and good project management. For more Owner Builder Resources, click the top Nav Bar titled "Owner Builder". Or go back to my Groundwork page. Or return to Kithomebasics home page.